In Rome, the victims of the tragedy in Las Vegas have been honored. In a vigil organized by Rome’s American parish of St. Patrick’s, located on Via Buoncompagni, a special prayer vigil was held this evening, Thursday, Oct. 5, 2017, to remember those innocent victims lost. During a concert at the Route 91 Harvest Festival on Oct. 2, more than 58 lives were claimed and left some 500 others injured, marking the worst mass shooting in US history. The singing of Amazing Grace by the entire congregation was at the start of tonight’s vigil, where representatives of the US Embassy to the Holy See, which helped organize the event, were also in attendance. In his homily, Fr. 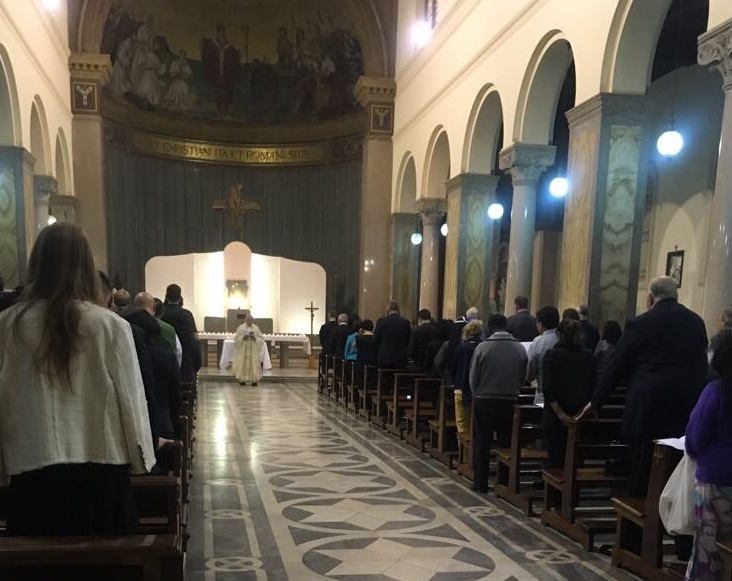 Greg Apparcel, chaplain of US faithful residing in Rome, asked those present to observe a few moments of silence for those “servants tragically torn from this life,” and for those wounded and for the country. Mr. Luis Bono, Charge d’Affaires at the US Embassy to the Holy See, offered a reflection where he condemned mass shootings, recalling those in Orlando, Florida, and Newtown, Connecticut, and called for solutions. Pope Francis expressed this in his condolences to the loved ones and victims of those affected by the tragic shooting in Las Vegas on Oct. 2, 2017, in a message sent on his behalf by Vatican Secretary of State. In it, the Pope assured those suffering of his prayers, thanks those responding to the tragedy and commends the souls of those who died to the merciful love of almighty God. Located just a few steps away from the U.S. Embassy to Italy, St. Patrick’s Church is the new American Catholic parish in Rome. The community moved to the new church from the church they had called home for the past 95 years, Santa Susanna.